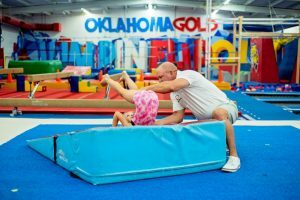 Oklahoma Gold has some of the best facilities for teaching and mastering tumbling in the state. We have five in-ground trampolines, a 70-foot in-ground Tumbltrak and a 100-foot in-ground rod floor. In-ground equipment is safer, helps tumblers with their confidence and leads to faster paced skill development. BEGINNER LEVEL: This class will learn skills like cartwheels, handstands and backbends. No pre-requisite necessary. This is perfect for the gymnast that just wants to tumble–no bars, beam or vaulting in the class.